[Think Aloud] – #32 – 5 Tips To Book Outlet Like A Boss | thoughts and afterthoughts. At first, I wanted to call these “hacks” but they’re really simple things I’ve come across that you can use to optimize your shopping habits on the discount store. I should preface this post to tell you that these tips work as of now (March 2016) and continuous improvements may change things in time. I’ve essentially turned discount book shopping into a science. Ever thought: “damn, I wish I saw that book on sale”? As a self-proclaimed valued customer of Book Outlet (meaning: I basically check the site very day), I’m here to inform you with 99% certainty that products are re-stocked–and appears on the site–at or around 12:45 a.m. EST. Why this arbitrary time? Couldn’t tell you. Just take my word for it. Note: this doesn’t mean there aren’t inventory changes made throughout the day (re push promotion). It’s just that the standard batch release is reflected on their “New Arrivals” during this time. While I mentioned above that items can be seen every morning, the exception is Monday, which I’ve typically only seen non-fiction, compact-CD, and miscellaneous releases. Tuesdays are typically the start of the “50/50” sales; 50 listed titles at [a possible additional] 50% discount (e.g. currently “Biography/Autobiography”) at 10 a.m. — I could be wrong with the timing on this though but my e-mails don’t seem to lie to me. Are you unsure if you want to buy your item now or later? Worried about the true quantities left? When you add an item to your cart, the quantities displayed “x in stock” represents the total stock of inventory available — note: this value doesn’t reflect other customers putting the same item in their cart. For quantities displaying “100+ in stock“, it doesn’t really provide a good indicator as to how much is truly available. And if the price isn’t right, you might be wondering if you could wait on it to see if the price drops to wait to purchase it. Because really, a large quantity left unsold beckons the need to lower the price, right? It’s all a mind game, really. Step 1: Add item with "100+ in stock" quantity to chart. Step 2: Click on "Checkout" >> "Proceed to Checkout"
If someone you know has recently bought an item, they go to their “Past Orders” page (located at the bottom of the site) and click on their order number which they purchased said product. It will display the total quantities remaining of that product. Note: the item purchased is unique in that “Scratch and Dent” and “[Default] Bargain Books” are identified as different items (e.g. if your friend bought a S&D, the amount in stock reflected will only display the same S&D items). Bonus: books can be restocked and may not yet be reflected until the next day rolls over and can be checked using this method. You just need a friend who has bought it previously. I’m not sure what it looks like on the US/.com side (frankly because I’m too lazy to create a .com account) but on the Canadian checkout, know that the default is “Canada Post Regular Parcel” which may not reflect the cheapest option. I’ve noticed in various iterations that the break-even is 7 books before the Xpresspost costs less than the default. Otherwise the Regular Parcel, I found, is usually cheaper. 1) How has your experience been with Book Outlet, if you’ve bought from them before in-store or online? 2) If you’re an avid shopper on Book Outlet, do you have some tips and tricks to share? I’m on team Hoard All The Books because I’ve spent thousands hundreds on Book Outlet and have probably only read ~20% of what I bought. Either way, I hope this post helps you spend more money. Also waiting to be endorsed by Book Outlet. Great tips! I have an account and wish list on there but I haven’t ordered any books from it yet. I’m waiting to do a really large haul this summer so this will come in handy for sure! Noooooooo. I’m trying to stay OFF Book Outlet. I haven’t looked at it all month and I’m dying inside. I’ve even been deleting the emails before even opening them LOL. Now I have the biggest urge to go look at books on there right now, sigh. This is an addiction. I will definitely try out book outlet! Usually I stick with thrift books which seems to give similar deals and shipping but I wouldn’t mind expanding my horizons! I’ve never bought anything from Book Outlet (GASP!). Maybe I need to check it out. I’m all over Kindle deals, though. Their sales are amazing, though. Nice post on the science of book shopping 😉 Heard a lot about the Book Outlet but I don’t think they ship to the UK, so I mostly shop on Amazon and Wordery. I rarely buy books at a bookshop now because I like a good bargain 😀 Its a great idea that they have a Faux Checkout! Great post! I’m checking their site, 10times a day?! Prices are so addicting. I cant find that prices in here. 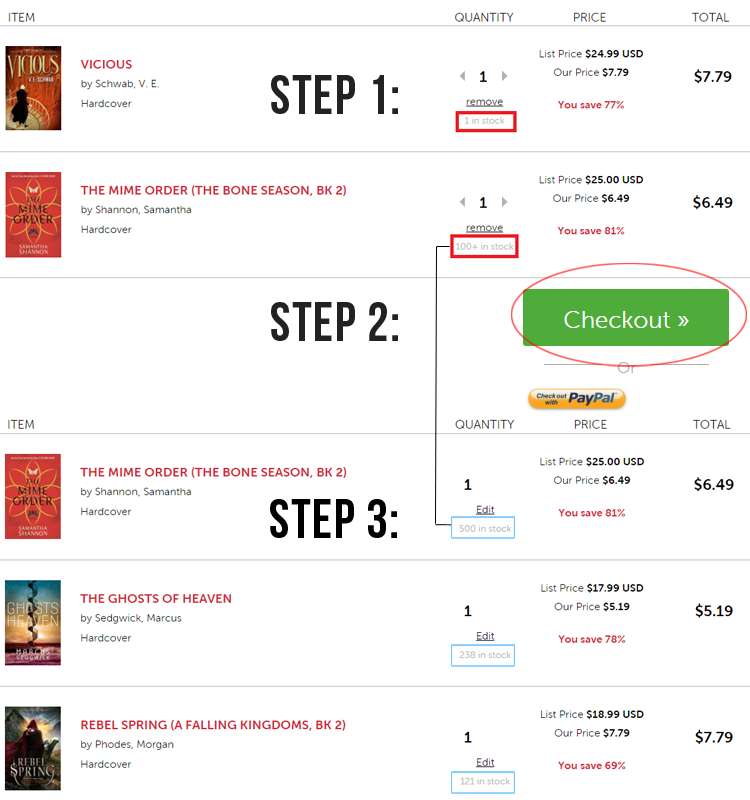 I made my first order in bookoutlet 2 weeks ago. Ive been eyeing this online store since last year but I cant purchase because they dont ship to where I live. But that didnt stop me. Haha! I’ve only ever ordered from BookOutlet once, and while it was a good experience in terms of navigating their website and receiving my books in a timely manner, I just can’t get over how they are sometimes slightly worn/dented/etc. (and I didn’t buy from the “Scratch and Dent” section). It’s something so small yet that really irritates me, so I’m wary of ordering again for fear that all of their books come with at least some mild imperfections. This is really useful! I only started shopping at the Book Outlet recently, and have only done two orders. I like it but find it a bit overwhelming and sometimes hard to navigate, so this could come in handy! I love Book Outlet! It never occurred to me to check the other shipping options when I buy – I’ll have to check that out next time! I haven’t used this before. I’m just addicted to physical bookstores. However, given how much money I’ve spent in the last two years building up my classroom library, and how many more titles I feel we NEED to have in here, I may have to start. Thanks for the tips on how to get the most out of it!